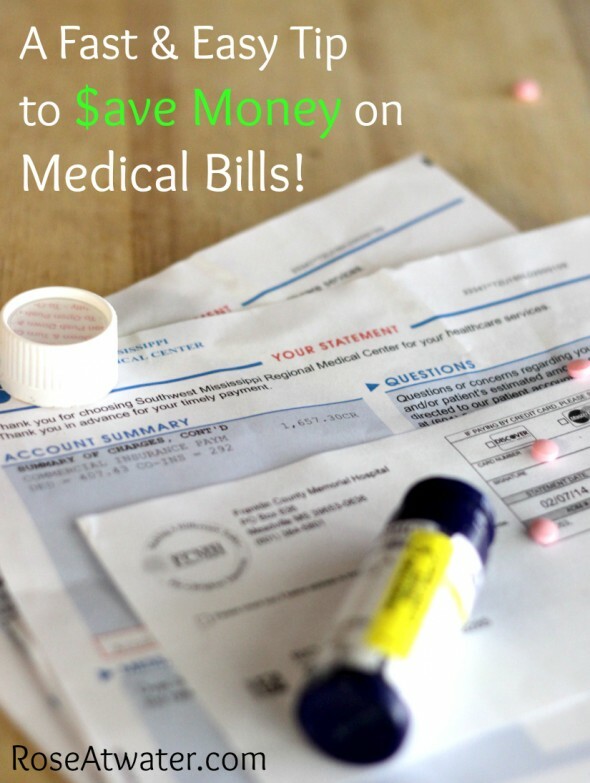 I’m not an expert by any means, but today I wanted to share a tip on how to save money on medical bills. Are you ready for my ingenious tip? Now I realize when I spell out the details of this that it will not be possible for everybody (depending on the amount of your medical bills, whether or not you have a savings account, etc.) , but if it is an option, then by all means, don’t pass it up! And if this is obvious to everybody else already… then can we at least pretend that someone else needed to hear this? So here’s the deal… recently my husband has been having some health issues. In December, January, and February, his medical bills ended up being several thousand dollars (before insurance). The good news is that we live debt free (except for our home), we have an emergency savings account, and we have pretty good insurance. When the insurance company had finally come through on some of the bills (they haven’t all come in yet), we ended up owing only around $2000 (so far). I know – it’s still ALOT – but we do have enough in savings to cover that, so I breathed a little easier. But I still don’t want to spend any more than absolutely necessary, so I decided if I could get any more discounts by asking, then I wanted to. I got this idea a few years ago when I had to have an out-patient procedure done and before leaving the hospital, they told me if I could pay our co-insurance part in full that day, then they’d give us a 10% discount. So when our recent bills started rolling in for all of these tests, I decided to call the billing departments and ask, “If I pay this bill in full, can I get a discount?” And guess what? They gave me 10-15% discounts every time! Just yesterday I had a bill for $699.90 and the insurance had pad all they would pay. But after three very short phone calls, I had saved some more money. When I say short calls, I mean it. There was no haggling or stress… I called and left a message in the billing department, she called me back and I asked her for the discount. She got off to consult with her manager, then she called me to tell me the results. And what were those results? My bill was reduced by 15% with a 3 minute phone call. Now I only owe $594.92. That’s almost $105 saved with very little effort! So here’s my advice. If you have medical bills, whether it’s several like we have right now or only one, and if you have the ability to pay the bill(s) in full, call first and ask if you can get a discount by paying with cash or paying in full! Who knows… maybe you’ll end up with an extra $100+ in your pocket! As a side job I actually help fix peoples credit and help with medical bills. Right out of high school I went to a college five hours away from home. I have a lot of health issues and was a full time student plus worked two jobs. I owes $10,000 to doctors and hospitals and there was no way I could pay it. I was paying what I could which was a whole $10-$20 a month so I was sent to collections. I called the hospital and explained my situation and she admittedly told me something she shouldn’t. She told me to call back and ask if they would write it off as charity. That way they would get ALL their money, and I would pay little to nothing. It’s easier when you’re in collections, but I did what she asked and of the $10,000 I think I paid $140 total.. Including my petty payments from before. Doctors and hospitals write so much money off a year in charity, and come tax season they get every cent back so they don’t lose at all. I’ve been doing this for awhile now and I’ve learned so much about insurance companies and everything else. Sometimes you do have to fight for it, but if you don’t have the money like I didn’t it’s worth it. And everyone would prefer to get as much of what you owe as possible.. So why not ask them to write it off as charity so they get every last cent back? It’s worked for me more times then I can count. Like I said I do this bad credit fixes as a side job, and the most amount I had written off was over $40,000 all because the family forgot to get a prior authorization. They never paid a dime and the company received all their money still.